I know I'm late, I lost my blo-jo again, ha, that sounds so rude! I've had no motivation for blogging again lately, and I've been so tired that I've hardly done anything-time just flies. But hey ho, these are some of my May favourites :) Read on for my waffle. 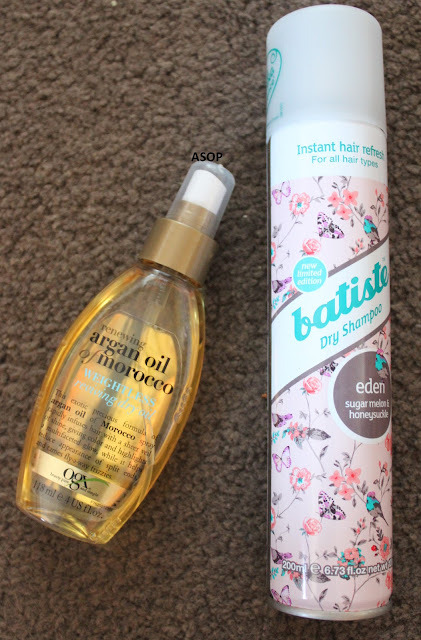 First off in last month's favourites, there are two hair products, both of which I'm in love with, they're amazing, and smell lush! OGX's renewing argan oil of morocco is amazing, we sell so much of this at work as there is a giant hype about it, but I think it's a definite must, and it has become a staple in my daily routine! It makes my hair feel and look so much better, it leaves it shiny and soft all day long-my hair is pretty shiny and healthy anyway as I don't use heated appliances-but this makes it look about 5x healthier :). It also smells amazing and doesn't leave your hair greasy-just don't spray your roots! Another favourite is Batiste's latest dry shampoo 'Eden', sugar melon and honeysuckle, which is a limited edition scent and only available from Superdrug. This smells amazing, and so summery-it's my favourite dry shampoo scent as of yet, and I think i'm going to need to stock up on it before it gets discontinued! Usually, i'm not a fan of Batiste as it generally leaves a white tinge to my roots, but this one seems to be much lighter and soaks in a lot better, if I know i'm not going to be washing my hair the next morning, i'll apply a bit to my roots before sleeping to soak up some of the excess oil, and then apply some more in the morning. I do really love this scent though, so more often than not, I just add a bit to my hair for added volume even when I've washed it. The packaging on this bottle is lush; so cute and oriental! Two of last month's favourites were my No7 duo of Day and Night Creams from their latest release; Early Defence, made for younger skin. They're aimed specifically for my age range, leave my skin looking healthier and hydrated without looking oily. You can read more about them here. Another is Avene's Eau Thermale 'Thermal Spring Water', I had an allergic reaction to something on my face the other week, and sprayed Avene's spring water onto it a couple of times, which cleared it right up, so quickly! I've since stocked up on this stuff in bigger bottles, as I often have allergic reactions and skin irritations, which i've found this really helps with. It's so light on your skin, unfragranced, and not too pricey. It'll be great on hot days to cool down my skin! Palmer's Natural Bronze with their continuous spray is a must for a subtle glow, and colouring. My colleague recommended this product, and she looked amazing-so much darker, with no streaks. So then all of us at work went and brought one-got to say, we're a tanned bunch. This stuff is amazing, the continuous spray really helps to achieve a great even tan, without streaks. Since it's Cocoa Butter and fortified with Vitamin E, it also leaves your skin feeling amazing and soft. It really does dry quickly, meaning you don't have to sit in the nuddy for too long catching a chill, ha, and I found it didn't rub off on my clothes or bedding like previous fake tans i've used. I applied it 3 days in a row and looked like i'd just been on holiday for 2 weeks, but I didn't go orange. For me to recommend a fake tan is massive, I usually hate them, and can't get on with them, but this is definitely a must. It works on pale people too, i've seen some of my friends from ghost to tan. If you know me, you should know by now that Origins has become one of my favourite brands, and I recently won three more of their face masks in their weekly instagram 'Mask Monday' competition. Their overnight mask 'Drink UP-Intensive' is my favourite skincare product, so far. It smells amazing, and leaves my skin feeling so hydrated and healthy-without leaving it oily. Read more about it here. Another thing you should know about me, is that I fell in love with WicknWax candles last September, and I haven't bought any other candle brand since-their scents are so good, and they have such a great range, there's something for everyone. They're cheaper than Yankee, smell better, and last longer. My favourite scent last month was Wham Bar, I love sweet smells, and since I've been cutting sweets out of my diet, these give me a boost. I love, love, love this melt. 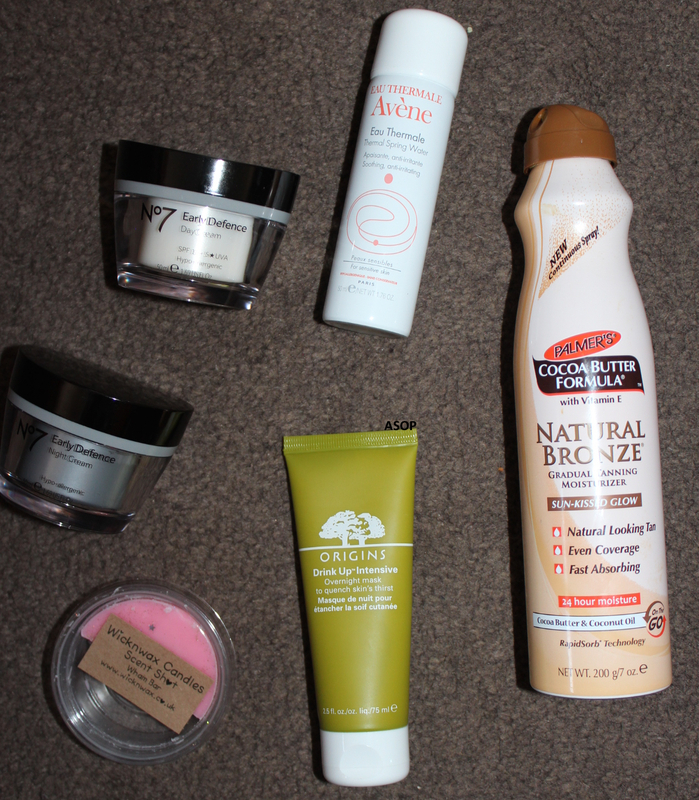 Read more about my hauls, and thoughts here. 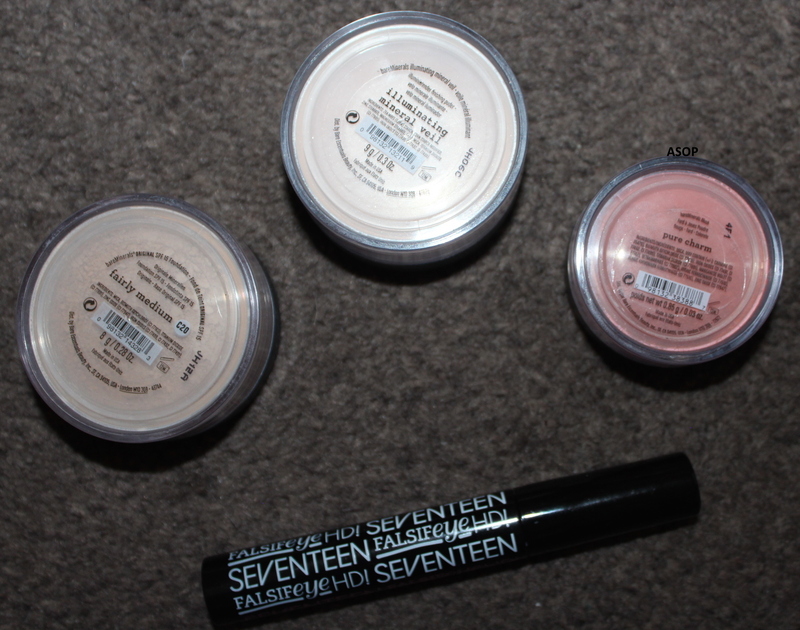 You'll also know from my previous bareMinerals haul post, that I've found a new love for their brand. I originally only bought their Original foundation, but went onto buying numerous other products which I love. You can read more about it here. Their Illuminating Mineral Veil powder is another makeup favourite, as it makes my skin look more awake and gives it a natural glow, whilst not making it look oily. Read more about it, here. Another makeup favourite is their Pure Charm blush, which really matches my skin tone well; giving me a natural looking blush, that isn't too red or pink for my skin. It blends in amazingly, and doesn't look fake-you can apply little at a time, so that you don't look like a clown. Read more about it here. Seventeen isn't a brand that I usually would've gone for, but people at work kept recommending it, and since i'm still looking for a perfect mascara, I thought I'd try them whilst they were on offer last month. I bought their Falsifeye HD in Blackest Black (I never understand how you can get blacker than black, but hey-ho). I find the brush on this mascara great for my lashes, and it applies amazingly, I don't get any clumps-but I do use the rolling the brush on a tissue method before applying. This mascara really makes me look awake, and stays on all day. It does smudge a bit, but all of them do on me atm... So maybe it's just me, lol. 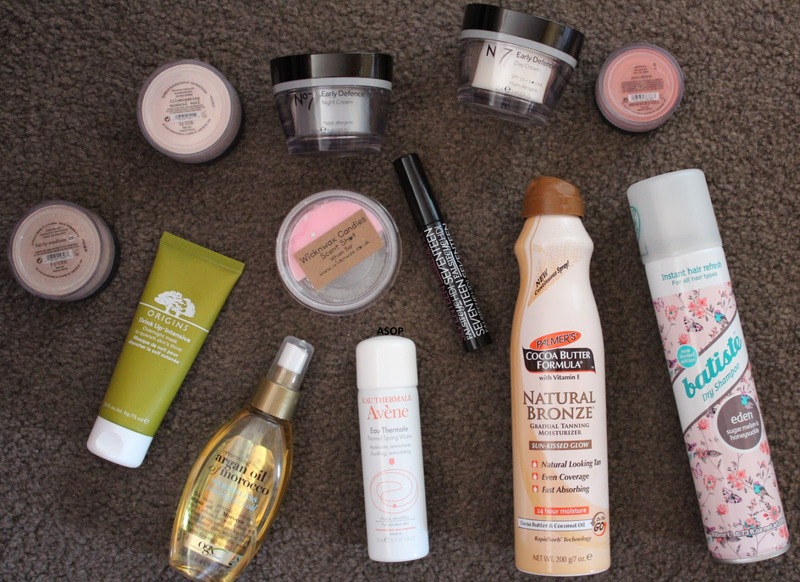 So what are your favourites from last month; would any of these products be on your list?